Thanks to the unique Smart Sensor ™ technology, which reacts as soon as you put on the headset, the headset understands how and when you want to talk and lets you answer calls without a single click. If you've already set it up, Voyager Legend will announce who is calling and is waiting for you to say "Answer" or "Ignore". Pressing the voice command button will report battery status, connection status, and other information. With advanced technology, the Voyager Legend Bluetooth® headset is even smarter. The name of the caller is communicated. Just say "Answer" to answer the call, or "Ignore" to reject the call. Press the battery status / connection status key or invoke Vocalyst to retrieve emails, messages, etc. You can rely on Voyager Legend. It is just as reliable as you and withstands rain and sweat. Even if you spill your coffee over it, it does not bother you. The Voyager Legend headsets withstand sweat and moisture thanks to P2i technology. The nano-coating is applied during the manufacturing process, protecting the headset from liquids and making it more reliable no matter where you are. Ist dieses Headset mit dem Gigaset S810A kompatibel bzw nutzbar? Hallo und danke für Ihre Frage! 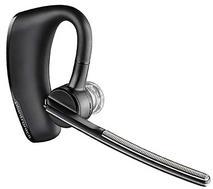 Das Plantronics Voyager Legend Bluetooth Headset ist mit dem Gigaset S810A Telefon kompatibel, und eine gute Wahl. Ist das Plantronics Voyager Legend Bluetooth Headset spritzwassergeschützt? Ich arbeite viel außen, wo es auch mal nass werden könnte, und bräuchte ein Headset, das das mitmacht. Das Voyager Legend Headset ist spritzwassergeschützt und hält auch mal etwas Regen aus!